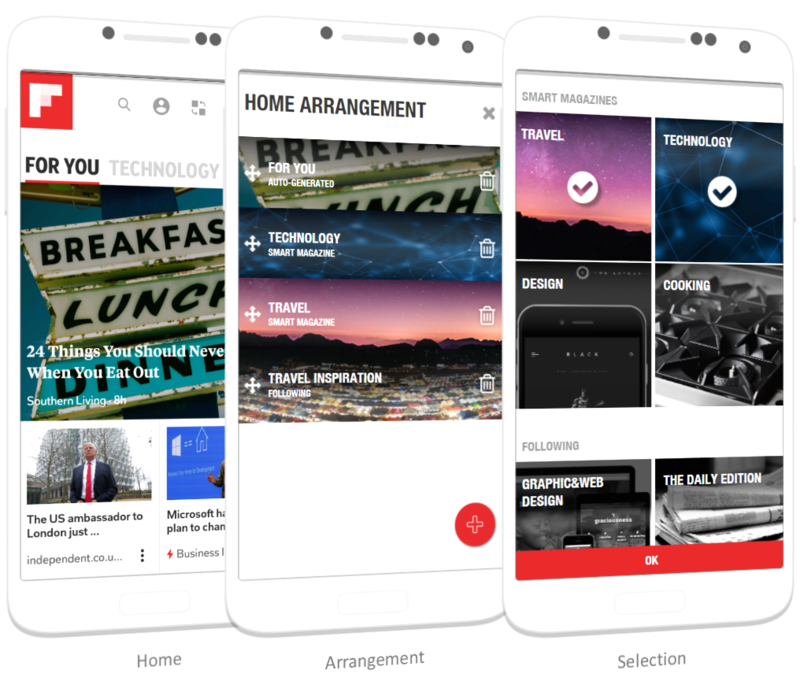 Flipboard is an app that aggregates content from social media, news feeds, and other websites and presents it in magazine format, allowing users to "flip" through the articles being shared. 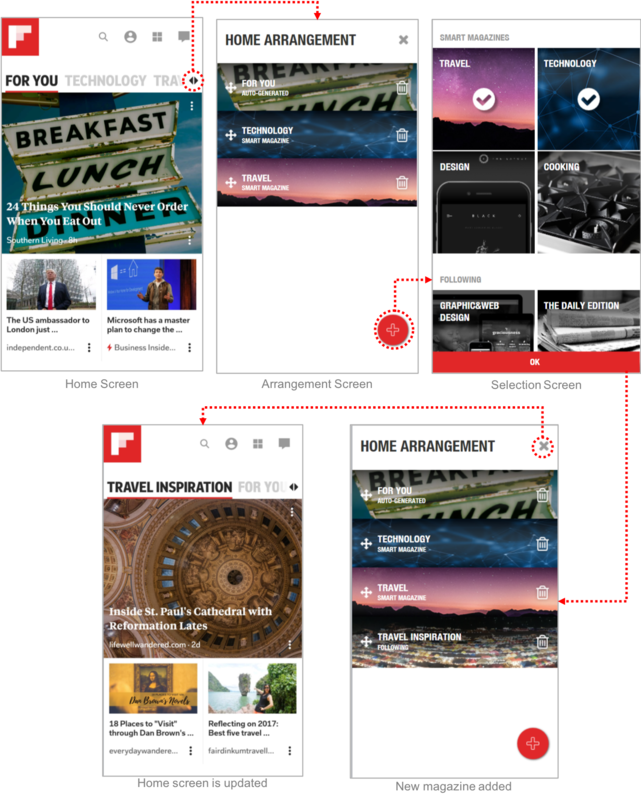 Last year in February, Flipboard released a major redesign aimed towards personalization — What’s your passion?. This new Smart Magazine feature gives users more specific control over the topics they read by selecting specific tags to create their own customized magazines. 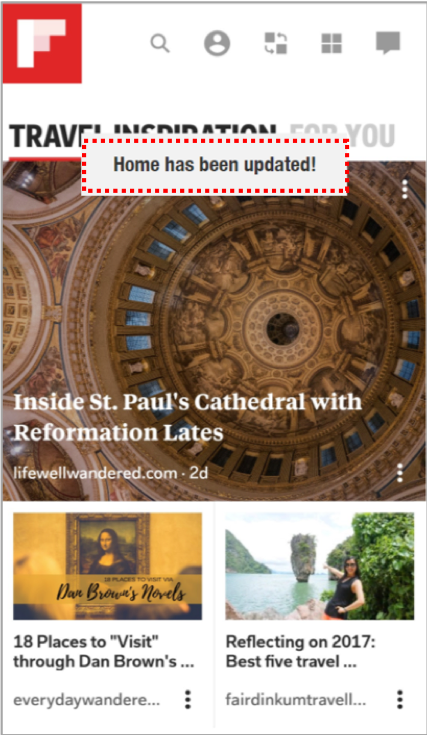 However, without careful use, this new feature may create a new hassle — a cluttered home screen with a lack of organization. Now that I can create my own magazines, is there a way for me to organize them on a rack? In this project, I propose a solution to take the personalization and customization a step further. 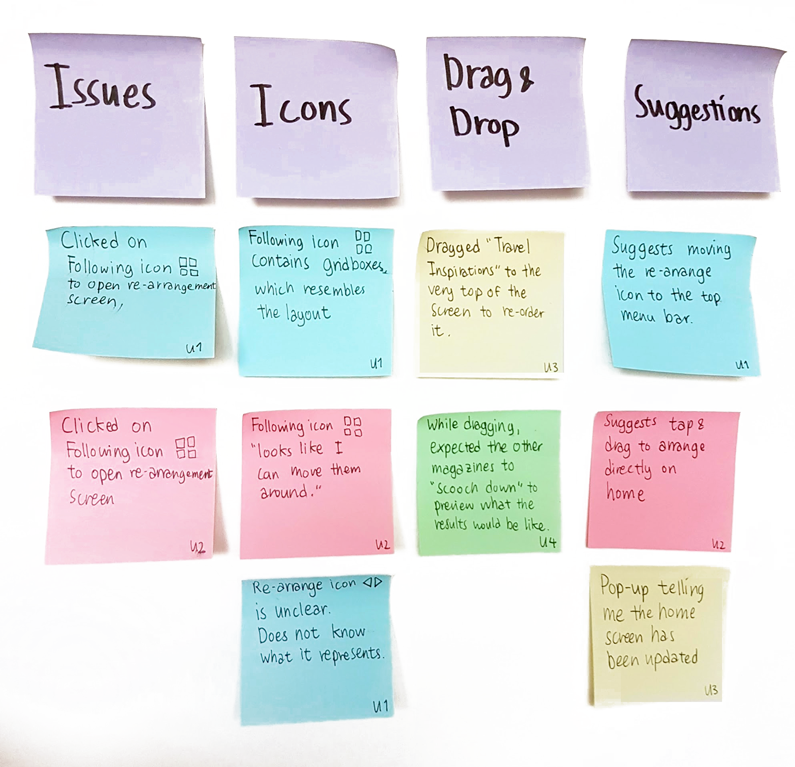 Taking a closer look at the current app, I identified the issues that prevents users from having a fully personalized home screen. Issue 1: While the app allows you to add or remove magazines from the home screen, there is no way to arrange the order of the magazines to be shown. The order is based on when the magazine is added. 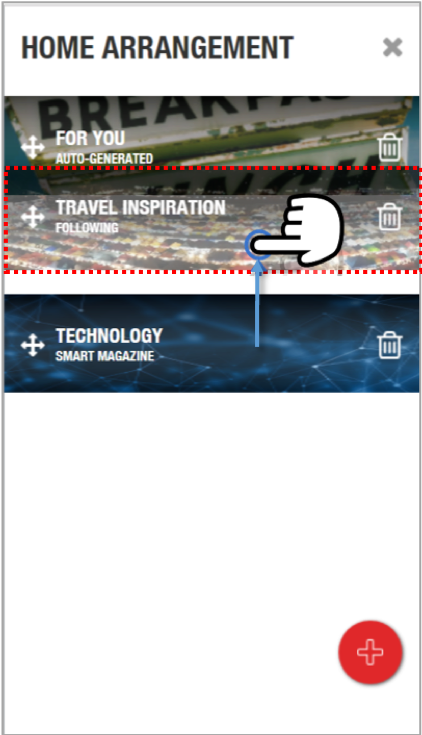 Issue 2: Following and Smart Magazines are kept separately. There is also no way to access the Following from the profile page, making it difficult to find. Issue 3: For You feed is fixed as the first magazine, with no option to be removed from home. Hence, the AI generated personalized content would always be prioritized over the user’s own customized magazines. Removing a magazine from home. After sketching out a few ideas, I narrowed them down to the 2 with the biggest potential. This is a convenient solution that does not require any additional screens. 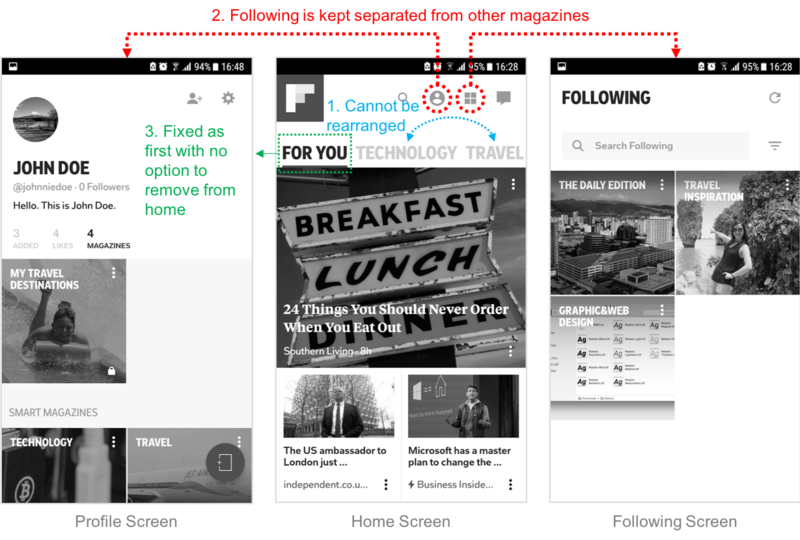 However, the feature is not easily discover-able and horizontal drag & drop may be very difficult to use if there are many magazines on Home. 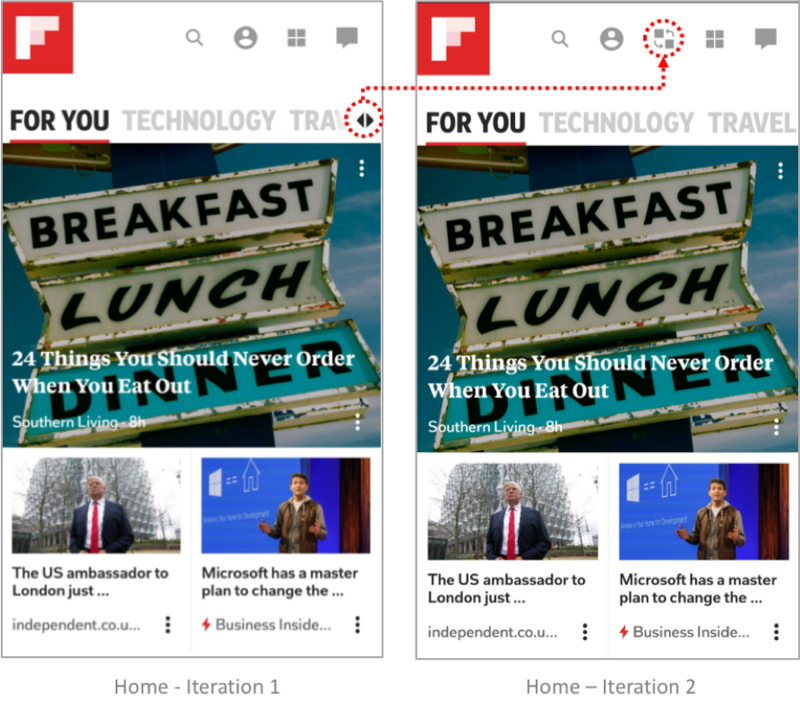 This option allows users to see a comprehensive list of magazines currently shown on Home, giving the big picture. The vertical list allows more flexibility and ease of use in moving the magazines around. I decided to go with the second option due to it better discover-ability and availability of vertical space to accommodate more magazines. You want to re-orgranize the magazines on your home screen. Add a new magazine called “Travel Inspirations” from your list of Following. Remove “Travel” from the list. Move “Travel Inspirations” to the first magazine. From the test results and feedback, I made some revisions to the design. One of the biggest issues from the testing is being unable to find the button to open the re-arrangement screen. One of the test participants clicked on the Following icon because "they look like grids that can be dragged around." Another participant expected the button to be at the top along with the other menus. When asked to re-arrange a magazine to the top, one of the participants dragged it all the way to the very top of the screen and waited a while before dropping. Another participant doubted whether she was re-arranging it right, because the other magazines weren't "scooching down". After clicking on "OK" and completing the task, many of the test partipants were not sure if they were "done." The lack of confirmation requires the participants to check the new order of the magazines themselves. Removing & ordering the magazines. 1. For re-design projects, study the brand’s style guide and company design trends. This is essential to creating a design that aligns with what the company would potentially create. 2. 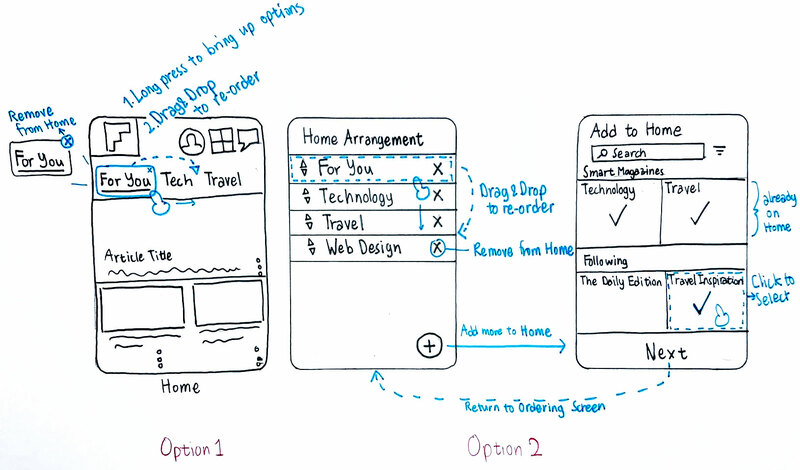 Keep it simple & stay consistent with the existing design. 3. Before jumping to a solution, double check to make sure the issue is real and needs to be addressed. If I had more time with this project, I want to do more research to see whether real users have been facing problems from the lack of re-arrangement feature. If so, it would also be insightful to know how they approach the problem using the current app. This data could lead to better informed design decisions. © 2017 Copyright: Vichita J.